SUBHEAD: Presentation by Arnie Gundersen on continuing damage to planet from Tepco's inability to contain radioactivity at Fukushima. 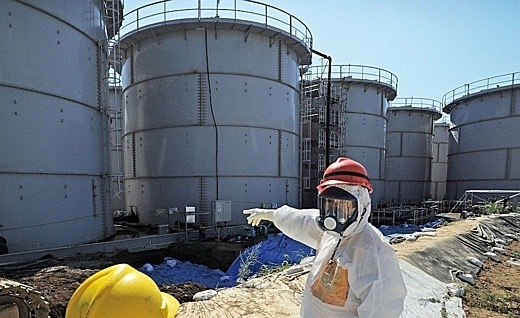 Image above: Temporary storage tanks in 2013 at Fukushima hold radioactive water. Race by Tepco to stop contaminated waterleaving site into the Pacific with an "ice wall" failed. From (http://abcnews.go.com/Technology/japan-spend-300m-ice-wall-isolate-fukushima-water/story?id=20144627). Nuclear reactors never shut down completely. After a uranium atom splits to create its power, the radioactive rubble left behind remains physically hot for about 5 years. So when the earthquake and tsunami destroyed the cooling systems at Fukushima, the nuclear fuel pellets that are usually contained in suspended fuel rods melted and wound up on the bottom of the 8-inch thick nuclear reactor. The steel from the reactor then melted too, which is called a melt-through, leaving the hot nuclear core lying on the floor of the 4-foot thick concrete containment. Fukushima Daiichi units 1,2, and 3 were destroyed by the heat and radiation inside, allowing holes and cracks to form. We know for sure that the Fukushima Daiichi containments are full of holes that allow groundwater to come in direct contact with each nuclear core. Whether or not the nuclear fuel melted through the concrete does not matter to the environment or the people of Fukushima. This picture is of a tanker truck. Each tanker truck carries 5,000 gallons of water, which is equal to 40,000 pounds or 20 tons. For you to have an idea of how much 300 tons of radioactive water is, imagine filling 15-tanker-trucks with radioactively contaminated water each day. Now remember that more than 1,500 days have passed since the disastrous triple meltdown at Fukushima Daiichi and multiply that times 15 truckloads each day. Thus, the equivalent of 23,000-tanker truckloads of radioactive water have already leaked into the Pacific Ocean. Worse yet, there is no end in sight. The real solution is to turn off the tap! Stop the groundwater flow. As Fairewinds anticipated, the Ice Wall is a complete failure. Groundwater experts from around the world have contacted Fairewinds many times to discuss their proven methods and technologies that would stop the inflow of water to the Fukushima Daiichi site, but TEPCO and the Japanese Government have continued to ignore experts in these technologies. There are ways to stop the groundwater. TEPCO is just not listening. Unlike Chernobyl, no one knows where the THREE melted nuclear cores are at Fukushima Daiichi. What is known is that the three cores are in direct contact with groundwater. As groundwater comes down from the hillside and infiltrates the site, it becomes contaminated with radioactivity. Then that radioactive water continues its movement and flows out of the reactors and into the surrounding area severely contaminating the ground and other water it touches as it continues its migration to the ocean. The ongoing migration of extremely radioactive water at Fukushima Daiichi is making the cleanup 100 times more complicated and 100 times more expensive than Chernobyl. To date, the cleanup of the Chernobyl site has cost more $3 Billion without adding in the cost of the ongoing exclusion zone wildfires that are spewing massive amounts of radioactivity back into the atmosphere. Fukushima will cost half a trillion. It is impossible to dismantle and cleanup the Fukushima Daiichi site in 30 years. It will take longer than 100 years to do that cleanup. Radioactive cesium, strontium and plutonium from Fukushima Daiichi will continue to bleed into the Pacific Ocean for decades because the groundwater flow is unmitigated. The radioactive waste in at least one quarter of a million dump truck loads will have to be dumped somewhere in Japan in a shielded and contained area to prevent radiological contamination of a new area of Japan. Thousands of young people involved in the decommissioning, demolition, and dismantlement of the highly radioactive site would receive huge radiation exposures. The cost to cleanup the Fukushima Daiichi triple meltdown site will approach half of $1 trillion. And finally, there is no place in Japan, or in the world, to store the three melted nuclear cores once they are finally removed, if it is even possible to secure and remove them. This is a technological feat that no engineer in the world has ever envisioned, since the nuclear industry never believed such a catastrophe could or would occur. Video above: Presentation by Arnie Gundesen on continuing damage to planet from Tepco's inability to contain radioactivity at Fukushima. From original article at (https://vimeo.com/133683521). How sustainable is PV power?